Download Resistor Plus 2019 setup installer 64 bit and 32 bit latest version free for windows 10, Windows 7 and Windows 8.1. This is an easy-to-use software utility that helps you calculate the value of any resistor, according to the color code printed on its surface. It may also be used in case of the SMD-type resistors, by decoding their letters and numbers. 2018-04-27 (10100). Malware Test (10100): 100% Safe Tested & Virus/Malware Free. Free software for eye protection and more! It protects your eyes while you are working on computer. Here is iOS Icon Pack, which will help each iPhone or iPad application developer get his GUI in order. The icons from this set can be used in navigation, tab bars and toolbars of iOS applications. BOXOFT SCREEN OCR is a fast desktop utility program that lets you to capture screen and convert screen text into editable electronic text files fast and easily. This is an easy-to-use utility that helps you calculate the value of any resistor, according to the text or to the color code printed on its surface. In order to find out the value of a resistor (plus the tolerance and the temperature coefficient), you have to select the number of bands and to click on their color. The second page of the program helps you identify the RGB colors in a certain resistor picture. In case of the SMD-type resistors, the procedure is similar: first, select their model; second, enter the printed letters and the numbers – by using either your mouse or your keyboard. Finally, the fourth program page allows you to calculate the total resistance of a circuit containing two resistors connected in series or in parallel. Resistor Plus free to download. Resistor Plus 2019 latest version. 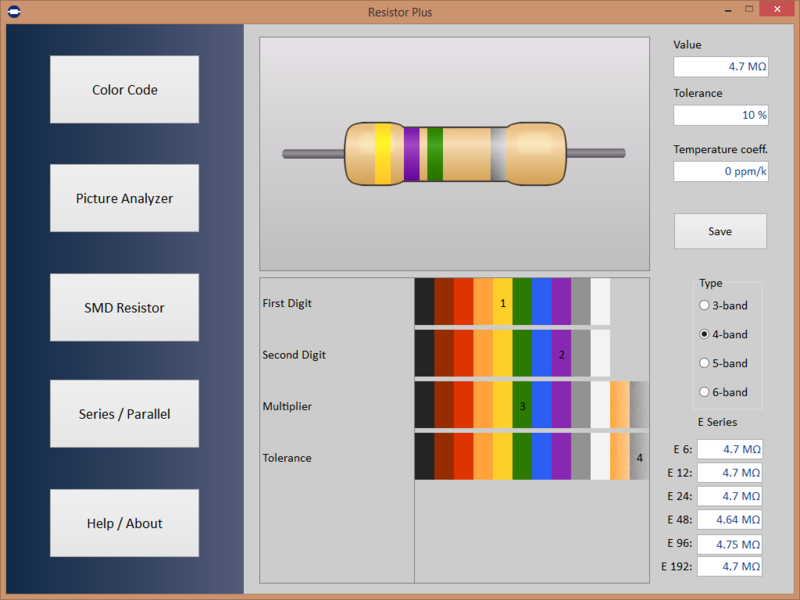 Resistor Plus for Windows 10, 7 and other prevoius windows versions. How to uninstall (remove) Resistor Plus Completely? Softati.com - does not store Resistor Plus patchs, serial numbers, activation, cracks, license key, keygen or any forbidden files that may cause harm to the original developer. Only free direct download for the original developer distributable setup files. Resistor Plus is developed and maintained by Microsys Com Ltd., Softati.com is not affiliated with this software developers by any means. All trademarks, registered trademarks, product names and company names or logos mentioned herein are the property of their respective owners.